Stonehenge is a prehistoric monument in Wiltshire, England. One of the most famous sites in the world, Stonehenge is the remains of a ring of standing stones set within earthworks. Archaeologists believe it was built from about 3000 BC to 2000 BC. 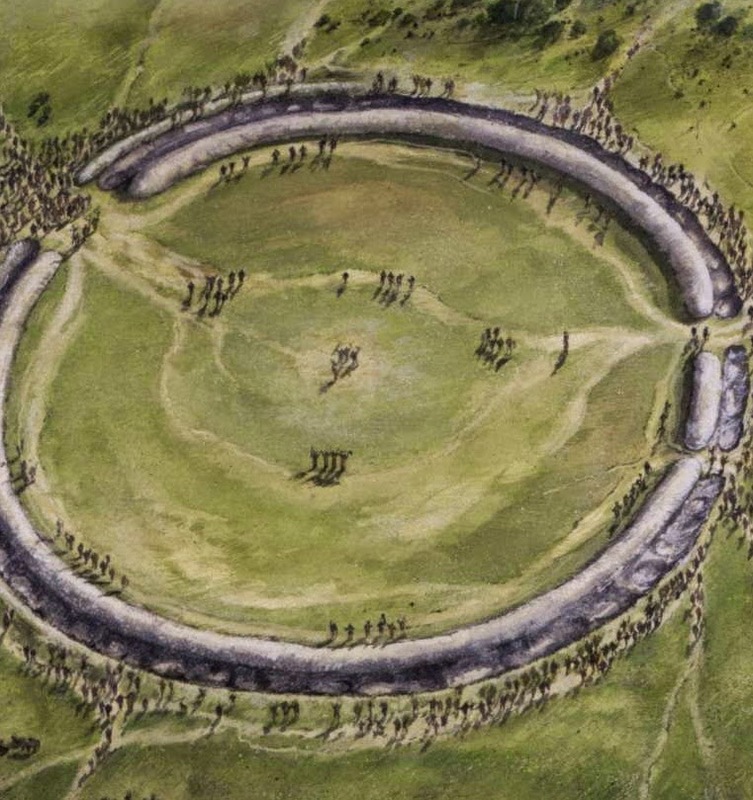 The original structure was a henge which is a circular bank and ditch enclosure, measuring about 110 metres (360 ft) in diameter, with a large entrance to the north east and a smaller one to the south. It has been dated to about 3100 BC. What most people don't know is that over 1500 years earlier, the same types of henges were built in central Europe. There they are called rondel enclosures. A number of approximately 120–150 Neolithic earthworks enclosures are known in Central Europe. 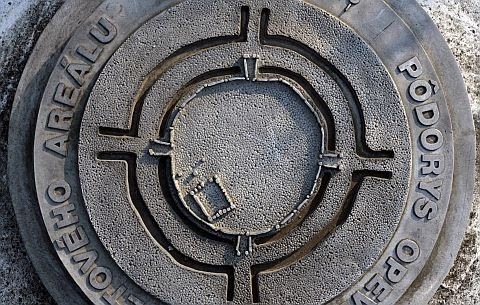 They are called Kreisgrabenanlagen("circular ditched enclosures") in German, or alternatively as roundels (or "rondels"; German Rondelle; sometimes also "rondeloid", since many are not even approximately circular). They are mostly confined to the Elbe and Danube basins, in modern-day Germany,Austria, Czech Republic, Slovakia, as well as the adjecent parts of Hungary and Poland, in a stretch of Central European land some 800 km (500 mi) across. They date to the first half of the 5th millennium BC; they are associated with the late Linear Pottery culture and its local successors, the Stroke-ornamented ware (Middle Danubian) and Lengyel (Moravian Painted Ware) cultures. The best known and oldest of these Circular Enclosures is the Goseck circle, constructed c. 4900 BC. The Goseck circle is a Neolithic structure in Goseck in the Burgenlandkreis district in Saxony-Anhalt, Germany. 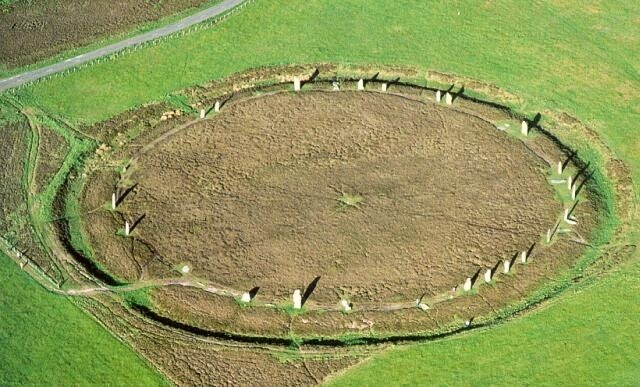 It is the oldest and best known of the so-called Circular Enclosures associated with the Central European Neolithic. It consists of a set of concentric ditches 75 metres (246 feet) across and two palisade rings containing gates in places aligned with sunrise and sunset on the solstice days. 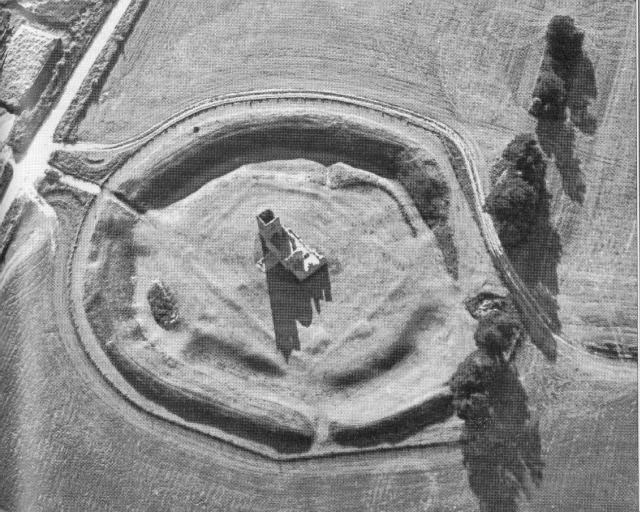 The Goseck ring is one of the best preserved and extensively investigated of the many similar structures built at around the same time. 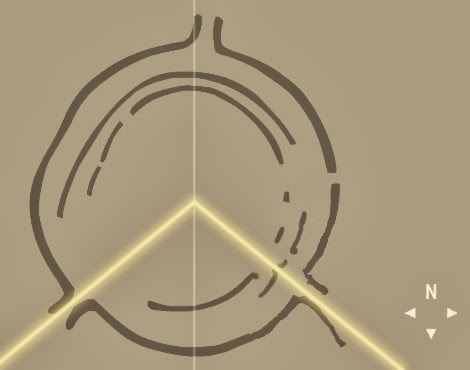 Traces of the original configuration reveal that the Goseck ring consisted of four concentric circles, a mound, a ditch, and two wooden palisades. The palisades had three sets of gates facing southeast, southwest, and north. At the winter solstice, observers at the center would have seen the sun rise and set through the southeast and southwest gates. Archaeologists generally agree that Goseck circle was used for observation of the course of the Sun in the course of the solar year. Together with calendar calculations, it allowed coordinating an easily judged lunar calendar with the more demanding measurements of a solar calendar. The Goseck circle is the oldest known structure with this type of astronomical alignment. 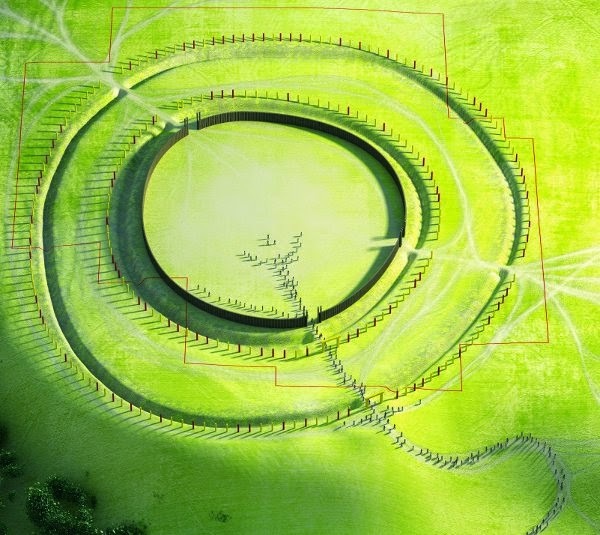 This is another Central European Henge, Rondel enclosure. This one is from Bučany, Slovakia. Does it remind you of anything? Celtic cross maybe? Principal types of the Neolithic-Rondels in central Danubian region: (1) Němčičky, Moravia. (2) Vedrovice, Moravia. (3) Nitrianský Hrádok, Slovakia. (4) Rašovice, Moravia. (5) Kľačany, Slovakia. (6) Strögen, Lower Austria. (7) Běhařovice, Moravia. (8 ) Hornsburg 3, Lower Austria. (9) Těšetice-Kyjovice, Moravia. (10) Rosenburg, Lower Austria. (11) Bučany, Slovakia. (12) Cífer, Slovakia. (13) Golianovo, Slovakia. (14) Svodín, Slovakia. In 2009 Czech archaeologists have uncovered four prehistoric rondel enclosures (a type of circular prehistoric earthworks enclosure), two of which are the largest in Europe. After examining 40 hectares on land, the experts gathered hundreds of thousands of finds. The most important ones include the four rondel enclosures. Two of the enclosures that archaeologists have uncovered near Kolin are 214 and 230 meters in diameter and have been dated to first half of the 5th millennium bc. The former was surrounded by four ditches, the biggest being 4.5m deep and 14m long. The other two enclosures uncovered near Kolin are 80 and 75 meters in diameter. Besides Neolithic finds, the experts uncovered a number of valuable remains of settlements from the Paleolithic period, from the Bronze and Iron Ages, from the Roman era and the early Middle Ages. This means that the area has been an important settlement and probably important ceremonial center for at least 5000 years. This is another example of potential cultural continuity in central Europe from neolithic to medieval time. Until recently, researchers thought that there are no henges in Poland. Henges were mostly found a little further south, where Neolithic farming flourished: in Germany, Austria, Hungary, Slovakia and the Czech Republic. In the mid 1990s, aerial reconnaissance led by Otto Braasch and Gunter Wetzel revealed the existence of rondel-type sites in central Germany, along the mid Elbe--Saale corridor and perhaps extending as far north as the lower Odra Valley. Even though the Neolithic dates of the most northern central German rondels have since been called into question, this discovery led to a significant northern extension of the known distribution of this monument type, making it very likely that rondels would also appear in the northern fringe of Danubian Neolithic distributions in Poland. The chance to verify this theory came during a training course for aerial archaeologists held near Leszno, Poland, in the summer of 1998. Braasch found the first rondel in Poland on the border between Lower Silesia and the Lebus Land. It lies on the northern slopes of the Dalkowskie Hills near the town of Bytom Odrzafiski in the fields of the village of Bodzow. 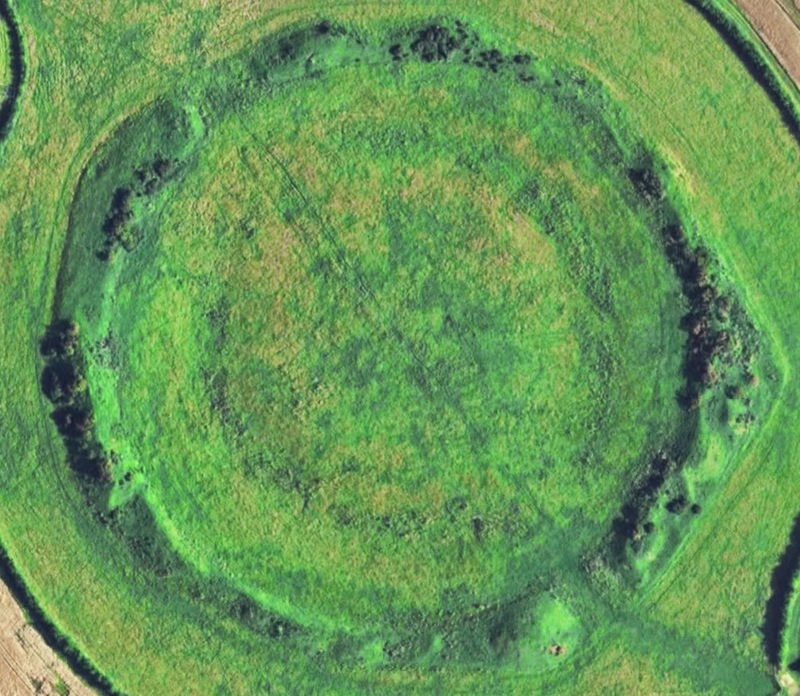 Further indications of the presence of putative early fifth-millennium rondel-type enclosures in Poland came in the year 2008, when aerial archaeological prospection revealed a circular, double-ditched enclosure with characteristic interconnected entrances at Wenecja on a hilltop on the eastern shore of Lake Biskupin in Kuiavia. By studying images available in Google Earth, a double-ditched and palisaded enclosure was discovered at Pietrowice Wielkie in 2011, a site which has produced Neolithic surface finds. 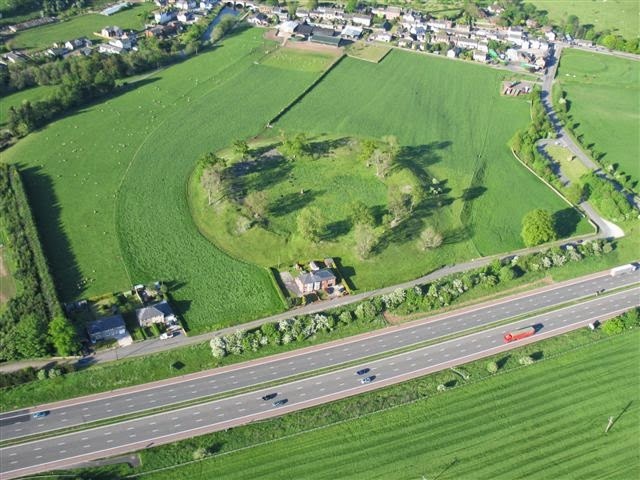 The latest archaeological data from the site is suggesting that the site could have been used as forth during the early bronze age Pre Lusitanian period, and that it could even have originally been built as an early bronze age fort. We know that many sites have been used for very long period of time and that during that time the use of the site sometimes changed. So it is possible that the bronze age fort was built on much earlier neolithic site. The distribution of rondel (henge) structures seems to suggest a spread from the middle Danube (southern Slovakia and western Hungary) towards the west (Lower Austria, Lower Bavaria) along the Danube and to the northwest (Moravia, Bohemia, Saxony-Anhalt) following the Elbe. 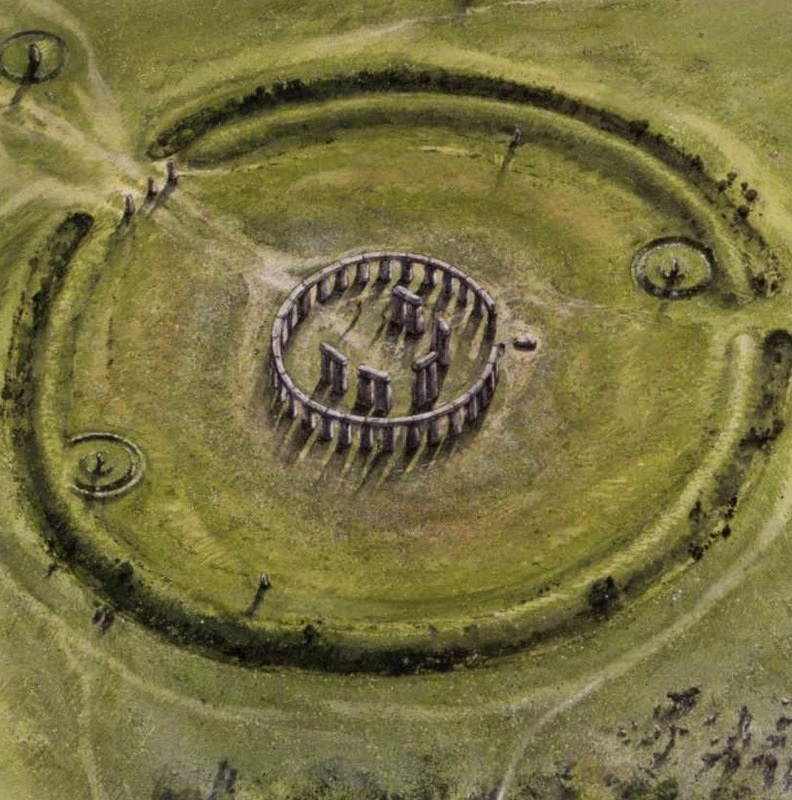 They precede the comparable circular earthwork or timber enclosures known from Great Britain and Ireland, constructed much later during c. 3000 to 1000 BC (late Neolithic to Bronze Age). 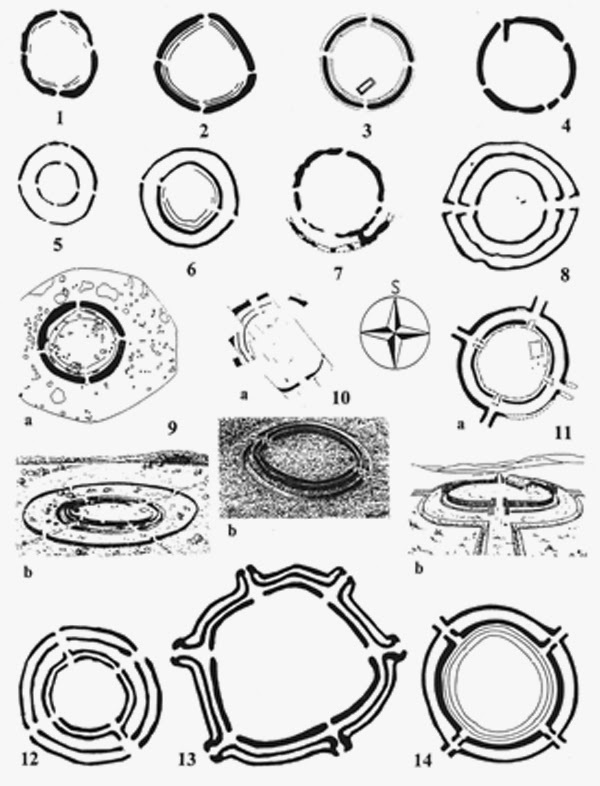 Henges, rondel enclosures originate in the middle Danube area and Morava area. From there they have spread northward towards south Baltic finally reaching Saxony and Pomeranija. This means that the culture that built these megalithic structures came from Central Europe and reached the British Isles via south Baltic, and specifically Elbe region, Pomerania, Pomorje, the land of Fomori. 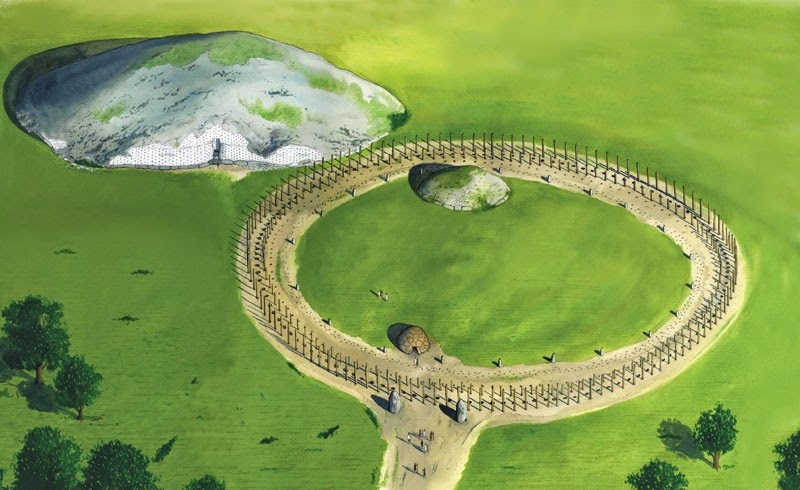 Ireland's Stonehenge, a 4,500-year-old structure at the Hill of Tara in Co Meath, has been re-created by archaeologists and computer-graphics experts. Underground remains of the structure were discovered by soil x-rays of the hill. Study of the remains of tree trunks have prompted scientists to conclude the hill was once surrounded by a “wooden version of Stonehenge” that would have been 250 metres in diameter. Archaeologists believe elaborately decorated timber posts and crossbars rose out of the ditch and surrounded the tomb, which is believed to be Tara’s oldest monument. 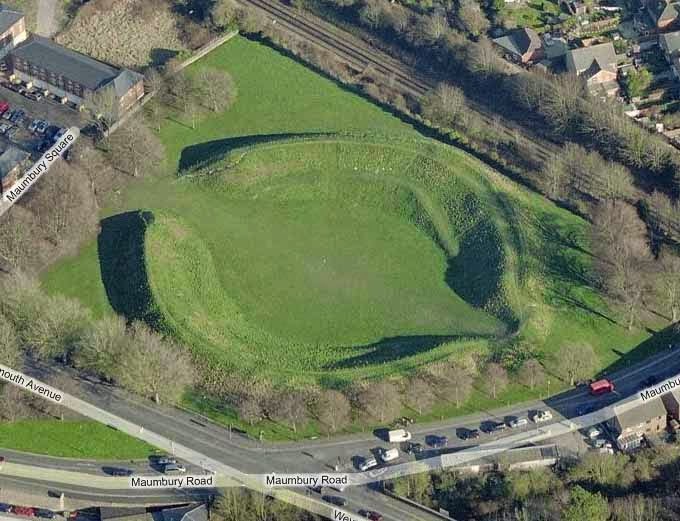 It is estimated the mound was raised in about 3,000BC, making it a contemporary of Stonehenge, the ancient monument in the English county of Wiltshire. 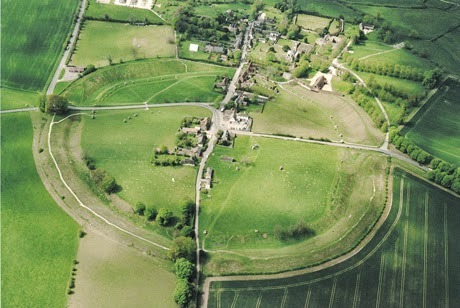 Rondel enclosure, henge structures are mostly interpreted as having served a cultic purpose. Most of them are aligned and seem to have served the function of a calendar (''Kalenderbau''), in the context of archaeoastronomy sometimes dubbed "observatory", with openings aligned with the points sunrise and/or sunset at the solstices. This is the case with the "gates" or openings of the roundels of Quenstedt, Goseck and Quedlinburg as well as in Stonehenge. The observational determination of the time of solstice would have served a practical (agricultural) purpose. It could have been used to maintain a lunisolar calendar. The accurate knowledge of the date of solstice allows an accurate handling of intercalary months and determining the the correct date for agricultural activities such as plowing, sawing and harvesting. But, by contrast to the long lifetime of the "Megalithic" culture, the time window during which the neolithic ''Roundels'' were in use is surprisingly narrow, lasting only for about 200–300 years (roughly 49th to 47th centuries BC). How is this usage period determined? Once the henge is built and aligned, further usage of the henge will leave no traces. To determine the day of the solstice all you need is to stand in the center or in any other predetermined cardinal point of the henge every morning and evening and note where the sun is rising and setting. Thus the henges could have been used as solar observatories thousands of years after they were built without any trace of usage being left behind. Is it possible that rondel enclosures continued to be used long after they were built? I will talk about the usage of henges and the link between the henges and the early agriculture in one of my next posts. Until then have fun and stay happy and healthy. And if you liked what you have just read, please leave a comment or google + the post. This structure in Pietrowice Wielkie is not a henge (rondel). It is only the ditch (moat) from the early Bronze Age. As for potential sites of bronze age circular fortifications, central Europe is littered with them and some of them are staggering in size. I would predict huge "surprises" coming fast and furious from the land beyond Danube or as Ancient Greeks called it Okeanos Potamos, Sea (Ocean) River. Balkan is the same. In Serbia there are dozen large bronze age hill fort sites which are awaiting excavation. And that is just what has been discovered so far. Most of the mountains are covered with thick forests which make areal mapping very difficult. In this area they found f.ex. knives from the Neolithic period, because the place is situated at the the Moravian Gate, a major transit route, but scientists are sure that this structure does not come from the Neolithic Age. Hi Jaropl, I have updated the article to say that the site at Pietrowice Wielkie could be an early bronze age Pre Lusatian site. Thank you very much for your info. I still think though that site could have been built on an earlier neolithic site. My research is showing that we have a cultural and population continuity in Central Europe from early neolithic time all the way to today. We know that many sites have been used for very long period of time and that during that time the use of the site sometimes changed. So it is possible that the bronze age fort was built on much earlier neolithic site. So I will leave the question of the original date of Pietrowice Wielkie site open for now. :) Take care and thank you again for your contribution, it is much appreciated.